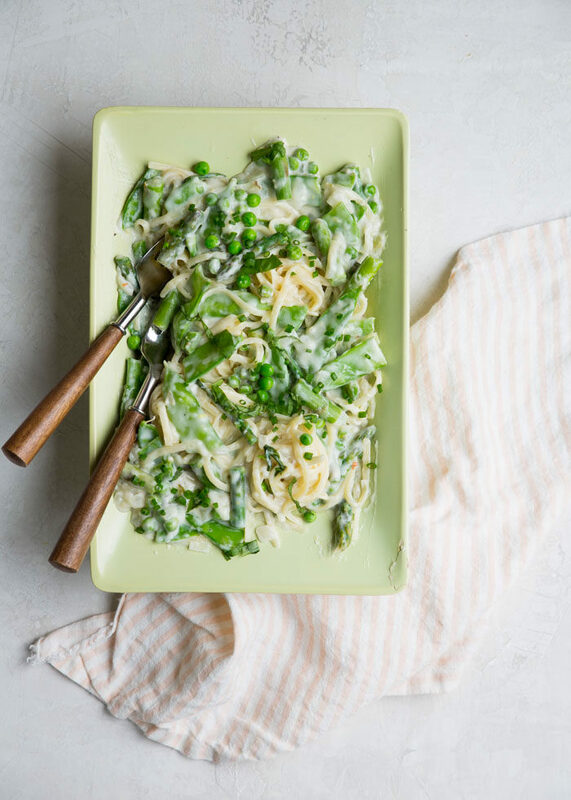 Whether you go for the vegetarian or the vegan option, this creamy pasta dinner is sure to be a fave. Packed full of vibrant spring veggies, brightened with lemon, and – maybe best of all – on the table in less than 30 minutes. 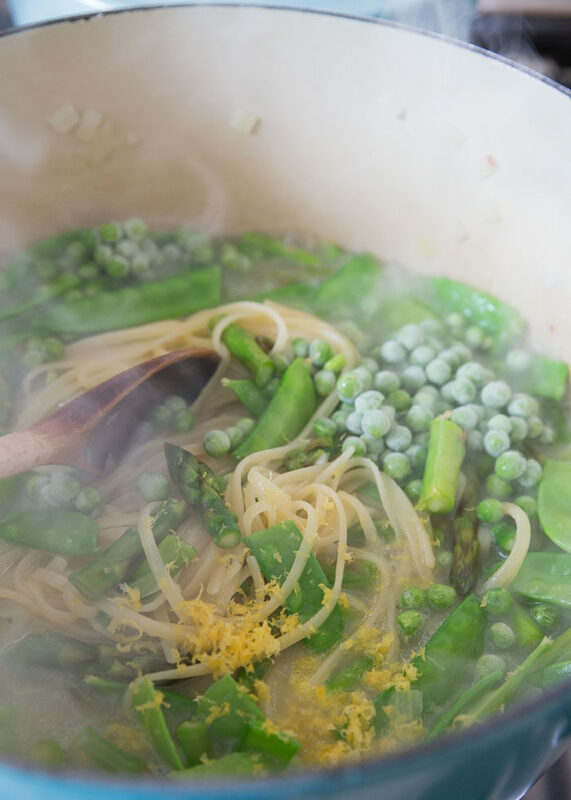 A few years ago, I created a One-Pot Pasta Primavera recipe that I shared on another website. Over time, it’s remained one of my very favorite easy meatless dinner recipes. My guy, who is usually about as carnivorous as it comes, loves it too. But because I’m me (and, well, because I had to eliminate dairy since then) I can never leave good enough alone. 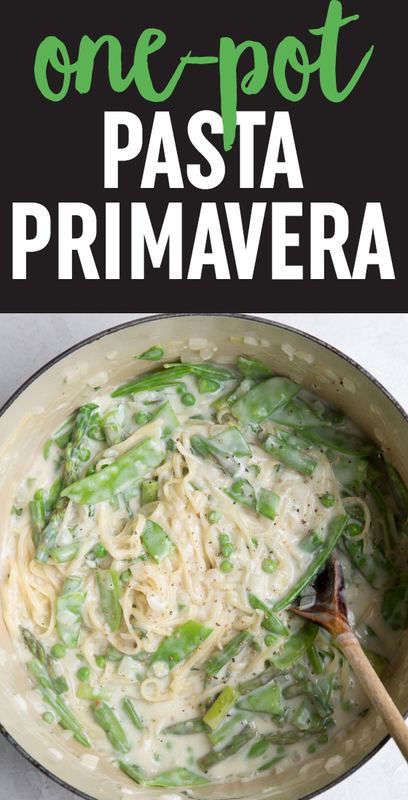 So I’ve nudged this One-Pot Pasta Primavera recipe here and tweaked it a bit there, making it – in my opinion – even more delicious, while also simplifying the ingredients list a bit. Win-win! Even though it’s been a few years since the one-pot pasta craze hit, I still find it to be such a brilliant (and tasty) way to get dinner on the table, fast. 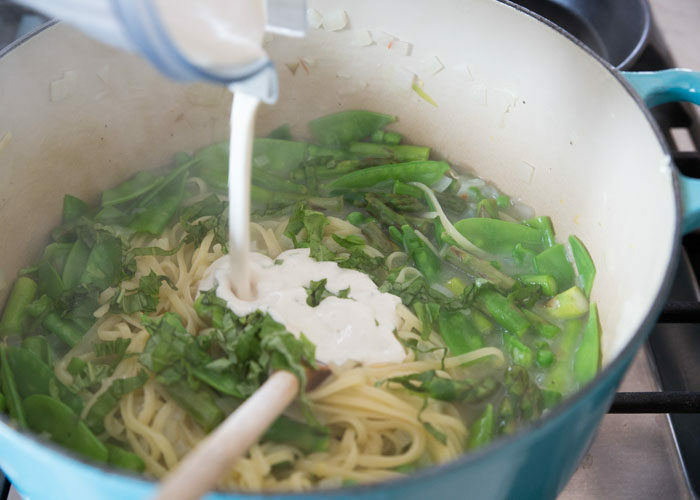 Throw it all in to one big pot – liquid, veggies, pasta and all – and cook. While you stir, the sauce gets thicker, the pasta turns tender, and the whole pot of goodness turns into one big rib-sticking meal. 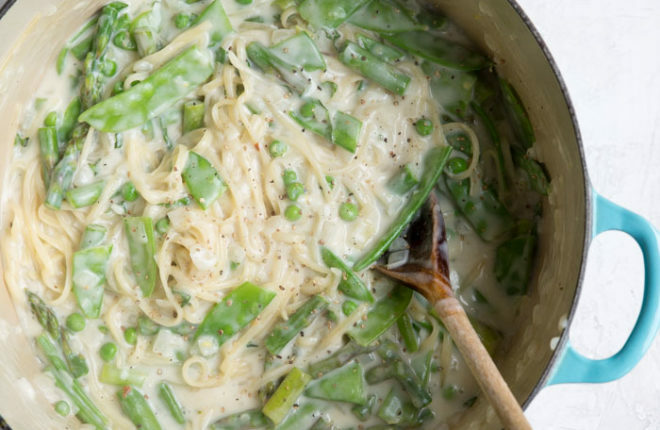 “Primavera” means spring – and this one-pot pasta recipe is all about spring. 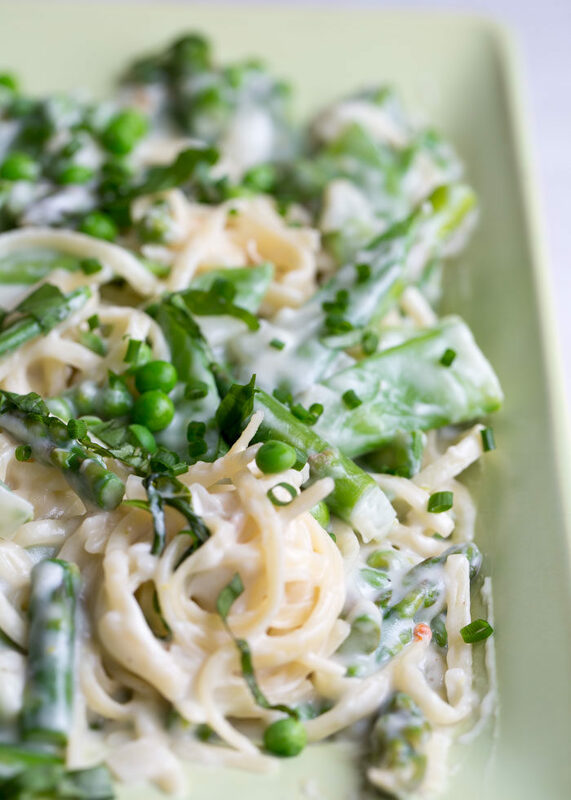 Asparagus, snow peas, a sprinkling of chives … it’s a green machine. My original recipe called for a few glugs of heavy whipping cream to lend that signature pasta primavera creaminess. You can still do that if you like! But nowadays, I add cashew cream instead and it’s diiiiivine. And it also makes it vegan! 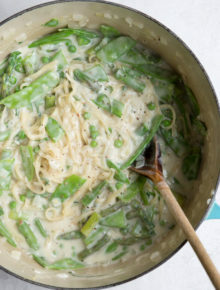 Either way, it’s rich and creamy and full of vibrant green veggies and if you try it, it just might become one of your favorite easy dinner recipes too! Cashew cream: If using cashew cream, you’ll want to make that first and have it ready to add at the end of the recipe. Use pre-soaked cashews or soak your cashews for 20 minutes in boiling water. Honestly, I soak my cashews in hot tap water for about 10 minutes and they’re good to go in my high-powered blender – so that might work for you, too, if you have a Vitamix or the like. To make the cashew cream, drain the soaking water and rinse your cashews, then add them to the pitcher of a blender (high-speed preferred). Add 1/2 cup water. Puree until smooth, 1-2 minutes. Set aside. Veggie prep: Have all your veggies chopped and your lemon zested and ready and ready to go before you start cooking the pasta. Once you start cooking, the pasta needs all of your attention. Add the water, pasta, onion, garlic, crushed red pepper flakes, 1 teaspoon water, 1/2 teaspoon black pepper, and olive oil to a large, heavy pot. Set over medium-high heat. As soon as the water/pasta comes to a boil, set a timer for 7 minutes. Stir/toss frequently with a wooden spoon or long-handled tongs at first and then constantly as the mixture thickens. After the first 4 minutes, add the asparagus and snow peas. Continue cooking for 2 minutes. Add the frozen peas. Continue cooking for the remaining one minute. Test pasta to make sure it’s al dente – not mushy, but not raw. Remove from heat. Stir in the basil, 1/2 cup of the cashew cream or whipping cream, and the juice and zest from the lemon. Taste and add additional cream, salt and pepper if desired. Garnish with chives and/or fresh herbs if desired and scoop onto individual plates to serve. Nutrition information based on cashew cream (vegan) version.